Jeroen van der Vliet at Van der Vliet Quality Yachts tells me he's closed on his listing for sale, a 26m Cammenga motor yacht, in an in-house deal. Built by the Dutch yard Cammenga to a design by De Vries Lentsch, she was delivered in 1970 as one of the yard’s popular Pacific 85 series and was last refitted in 2006. She is the first of six Pacific 85 models built by the now-defunct Cammenga yard and has proven ocean going capabilities. Accommodation is for six guests in three staterooms, a master suite, double and a twin and all staterooms have en suite facilities. A single 400hp Caterpillar engine gives her a range of 2,200 nautical miles at her cruising speed of 10 knots. 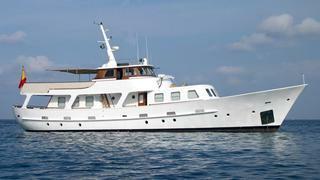 Now heading for a refit including new teak decks and a repaint job, the Pacific 85 was asking €795,000.